This write up on location of Agra discusses the geographical location of Agra in India. Situated in the extreme southwest corner of Uttar Pradesh, Agra stratches across 26° 44' N to 27° 25' N and 77° 26' E to 78° 32' E. Its borders touch Rajasthan to its west and south, the district of Firozabad to its East and the districts of Mathura and Etah to its North. Situated at the banks of River Yamuna, it has limited forest area sporting trees of Babul, Ber, Neem and Peepal. 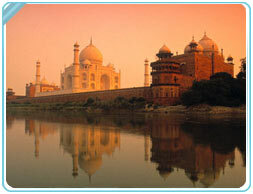 Agra suffers from extremities of climate with scorching hot summers and chilly winters. Monsoons offer some relief but the lanes within the city become very dirty and slippery during this season. However, the main road that stretches across the tourist area is good enough in any season. The best time to visit the city is from the Spring Season to the Autumn Season, i.e., from the months of March to October.